This week we continue our conversations with some of today’s most promising artists, turning our focus to Haydee Torres and her work. 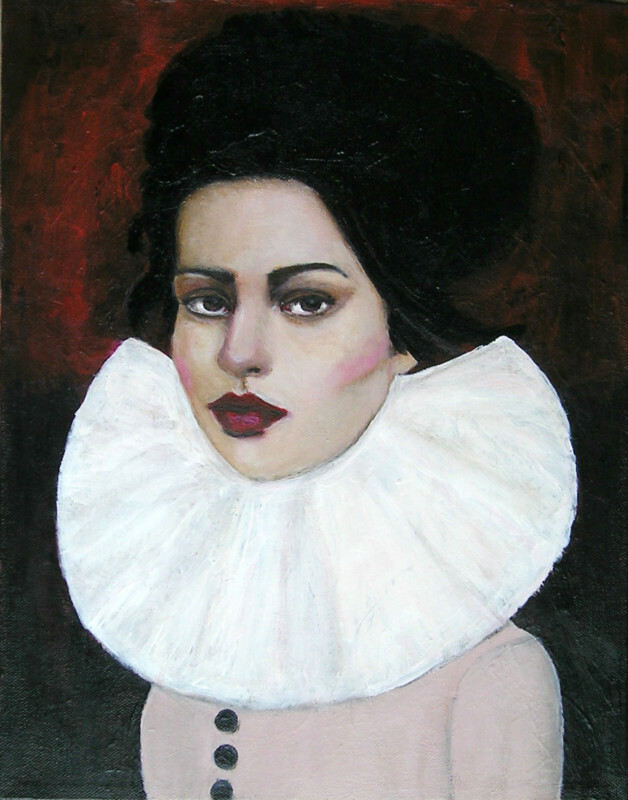 Haydee combines the strength and diaphaneity of her colors with the grit and gentleness found in the women in her portraits. This careful balance helps her work exude both fragile beauty and stability, and makes it hard for art lovers to resist. I’d like to go into detail about your work but first, please tell us more about you. I was born in New York, but my family relocated to Puerto Rico very early on in my life. Where are you currently living and working? I am currently living in Fort Lauderdale, Florida; my studio is located in my home. How did you get your start as an artist? I first discovered my passion for art while completing a fashion design program at the Art Institute of Fort Lauderdale. While taking my required courses, I found a particular interest in fashion illustration and my instructors further encouraged me to develop my drawing skills. This was a very important and exciting time for me. These were the first encounters in which I had found those around me referring to me as an artist which was a huge moment of revelation for me. Later on, I began taking drawing classes at a local college. One of my professors told me that he believed I had reached a high enough skill level to justify selling my work, which was an idea that both intimidated and exhilarated me. Please describe to us your process and your approach. Before I begin a piece, I take time to formulate a kind of mental image of what I would like to translate onto the canvas. There has to be a certain sort of craving to use a specific medium, which is the part of the process that I find truly exciting. The rest of the process is planning and is oftentimes very calm and almost ritual, but it can also be an extremely fast and disorganized process. I prefer to be listening to music, mostly piano such as Phillip Glass. Most of the time I find myself wondering and having this mental discussion about almost everything. I always been a thinker and preoccupied with existence, purpose and the different experiences that a person goes thought during their lives. As the piece develops, I take many photos to fix mistakes and make sure that the composition works and the colors are well balanced. Women figure prominently in your work. What is the reason behind this? and what are some of the characters of the women on these portraits? My work is very selfish because it is about me. Not physically but about the female in me. My women are representing a modern woman that has a real battle to get where she stands. That is why they are beautiful, tall hair like a crown and strong. I work from photos most of the time but sometimes my daughter will pose for me. Because of your approach to color it would be easy to connect your work to fauvism. How do you feel about this association? I can understand the connection. My approach to color is very spontaneous. I also associate my usage of color with expressionism, but I most definitely find that connection to be an extremely valid one. I like to leave a sense of mystery to my pieces so that the viewer can interpret them in their own unique way, so I really do think my work can be connected with several different styles. Who or what has been the biggest influence on your thinking? When I started painting my may influence was fashion. As I evolve I have became more interested in contemporary figurative work and expressionist art. What fascinates you most about the work that you do? The process. Because I don’t have formal painting education I have a very unorthodox way of painting.Also acrylics are quite challenging when it come to the figure ,I have to figure it out as I go. In your statement, you mention that your work encourages the viewer to develop their own narrative. What has been the most interesting interpretation of your work that you’ve come across? I will say that a lot of my female customers they connect with the painting in a personal level and they can see themselves as the figure in the canvas. When I had have the opportunity of meeting my customers in person they have this curiosity about the feelings of the woman in the painting.And that is when the narrative begins. For some people it is about just questioning for other they explain to me what is going on, so it is wonderful how everybody has a different narrative. 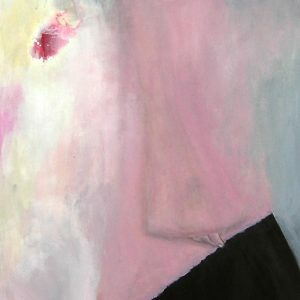 This painting is on a gallery wrapped canvas with finished black edges. It comes varnished and wired to hang. 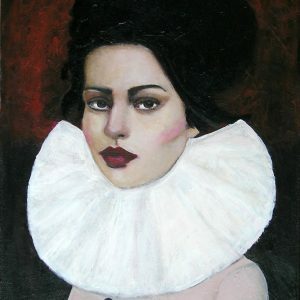 This painting is on a gallery wrapped canvas with finished black edges. It comes varnished and ready to hang. 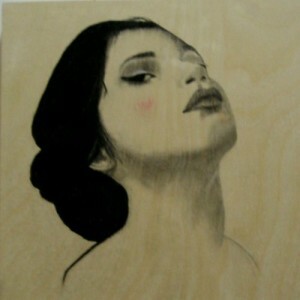 This piece is a charcoal and pastel drawing on a 12x12 cradled wood panel. The work is sealed with varnish for protection and comes wired to hang. 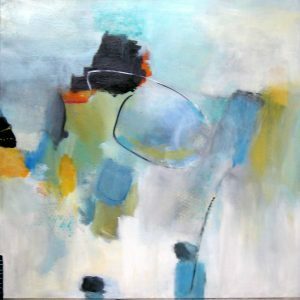 Contemporary Abstract painting on a 24 x 24 x 3/4 inches Gallery Wrap canvas. Varnish and wired. All sides has been painted black. Signed and dated on the back. Ready for hanging. Good Apple Art presents a curated collection of artwork from trusted galleries and artists all over the world. 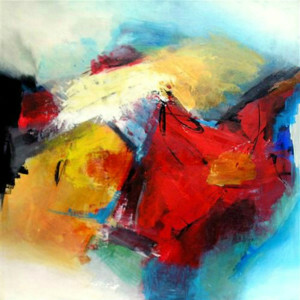 We go through thousands of art works and select only high quality pieces for you to choose from. The result is a competitive collection that represents some of the most precious art works at prices fit for new collectors and those looking to diversify their collections. The artworks that Good Apple Art selects are listed online by some of the most reputable galleries from leading Art centers such as New York, San Francisco, London, Germany, Hong Kong and more. Each of these pieces, along with other products such us books and art materials that we sell on www.appletonart.com are backed by Amazon’s A-Z guarantee which gives customers a greater sense of trust and confidence in shopping through our site. © 2017 Good Apple Art. All Rights Reserved.